News | Meyer Sound CAL Hard to Find but Easy to Hear at Southwest Churches | Meyer Sound Laboratories, Inc. | Pacific Video Products, Inc.
Two markedly different churches in the Southwest have found a common solution in Meyer Sound’s CAL column array loudspeakers, with each deploying systems that combine precision-tailored coverage for optimum intelligibility with a barely noticeable cabinet profile. Prestonwood Baptist, one of the largest multi-campus churches in the Dallas area, has seating for up to 7,000 in the main auditorium at its Plano campus. 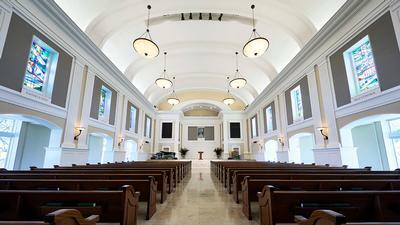 But for more intimate gatherings — weddings in particular — the campus also offers the 550-seat Faith Chapel. Although built in the 21st century, the traditional architecture harkens back to an earlier era, with stained glass windows, an arched barrel ceiling, and a reverberation time that is fine for orchestral music but highly detrimental to speech intelligibility. “The reverberation time was so long to the point where, if somebody was standing 15 feet away from you when the room was mostly empty, it was hard to understand what they were saying,” says Mark Coble, audio and acoustics specialist for Springfield, Missouri-based Paragon 360, the AVL design-build firm brought in to remedy the situation. The original solution had placed line arrays mounted behind grille cloth in faux organ chambers to either side of the chancel. The arrays had ample power, according to Coble, but lacked the precise control needed to avoid exciting the room. The new system comprises two CAL 96 loudspeakers mounted discreetly to the inside of the grille openings, with the beam tilt and spread of one CAL 96 spotlighting the lower seating and the other focused narrowly on the rear balcony. Two very small UP-4slimloudspeakers anchor the sound imaging for the front rows while two 750-LFC low frequency control elements behind the grilles supply low frequency extension. About 250 miles to the north, the First United Methodist Church of Tulsa faced a similar dilemma in the main sanctuary of its Tudor Gothic-style building. Completed in 1928, prior to any considerations regarding sound reinforcement, the church struggled with poor intelligibility due to high reverberation times, and was similarly loathe to mar the historic architecture with bulky speaker boxes. In this case, the Meyer Sound CAL solution was implemented by the Ford AV Worship Technology Group of Tulsa under the leadership of Jeremy Ball. Working with Meyer Sound Design Services, the Ford AV team proposed anchoring the system with two CAL 96 loudspeakers, again with beam tilt and spread precisely shaped to cover only the seating areas, front to back with no rear delays, and doing so without exciting the reverberant architecture. The front-most pews and side transept seating areas are covered by petite UPJunior and UP-4slim loudspeakers, also custom color-matched to blend into the masonry of the church walls. Ball attended the first worship service following system commissioning to verify results. “Members of the congregation were offering praise, saying they had never heard that level of intelligibility in the church,” he recalls.